And so Genesis 50 closes out the book quietly and solemnly. Jacob has died and Joseph follows. It is a time to grieve the loss of these two great men of faith. So how exactly to Egyptians honor the dead? Oh yes, I remember . . .
Born in Arizona, Moved to Babylonia. 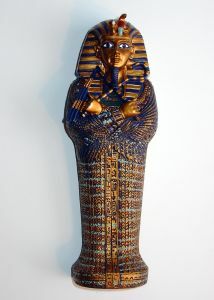 King TUT! Who knew that Jacob and Joseph become the stuff of childhood nightmares and terrible Brendan Fraser movies? Listen to Genesis (the band) all day. Thanks Shawn Smucker! What are some other things I should try? Leave a comment with a suggestion. Whatever one (or two or three) I think is the best I will do and then write a post about it on Friday. It took me a second to get that one. hahaha! The Egyptians first discovered fermentation, which of course leads to Beer. So you should drink a really good pint and toast to your favorite characters in Genesis.